Things to do and places of interest close by to Clarks Holiday Cottage , Dent, Dentdale. One of the noblest and most extensive monastic sites in Europe, situated in Skelldale, Fountains Abbey is one of the largest and best preserved Cistercian houses in England. It is a Grade I listed building and owned by the National Trust. Along with the adjacent Studley Royal Water Garden, it is a UNESCO World Heritage Site. 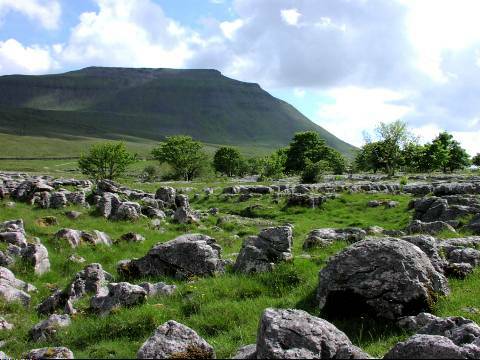 At 2,373 ft, Ingleborough, with its famous flat topped profile, is perhaps best known of the Yorkshire Dales' famous "Three Peaks"
Information and guide to the famous Settle to Carisle Railway, Dent station nearby is the highest main line station in the UK! Set in the beautiful and secluded valley of Dentdale, Dent is enclosed by rounded hills, dry stone walls, field barns, trees and hedgerows. The village has existed since Norman times, as the doorway on the north side of the church reveals, and retains a real feel of the past with its quaint cobbled main street and whitewashed stone cottages. Dent became particularly well known in the 18th century for its thriving hand knitting industry and its ‘terrible’ knitters, so called because of the speed of their needles and the fact that they were terribly good! It was also the birthplace of Professor Adam Sedgwick, a great Victorian geologist, who is commemorated by a huge granite fountain. The village offers interesting shops, friendly tearooms and pubs, quality galleries and craft workshops to tempt the visitor. For those seeking more active pursuits, there’s caving, horse riding, paragliding, cycling and walking, and fishing is also available on the River Dee. For more information contact the Local Information Point at Stone Close tearoom, Dent Tel: 01539 625231. •	Dent Beer - brews with great names like T’owd Tup and Ramsbottom Strong Ale are not to be missed! Brewed and sold locally. •	The Settle-Carlisle Railway Line. Dent station, four miles from the village, is the highest main line railway station in England at (1,132 feet / 345 metres)! •	The Discover Dentdale Visitor Centre (St. Andrew’s Church) - the ideal way to learn more about Dentdale past and present. •	Dent Heritage Centre - take a step back in time through Dent's farm life and history. There's even a nature trail with panoramic views of Dentdale. •	Sedgwick Geological Trail along the River Clough in Garsdale where you can see fossil remains and where limestone and older Silurian rocks meet. •	Stone Close Tea Shop with its flagstone floor, cast iron ranges, exposed beams and original fittings. This delightful 17th century listed building is also home to Dent Information Centre. Clarks cottage is 5 mins walk from Dent and is ideally situated for exploring the beautiful surrounding countryside whether its Yorkshire's 'big three' or a more gentle walk there is interest for all abilities. 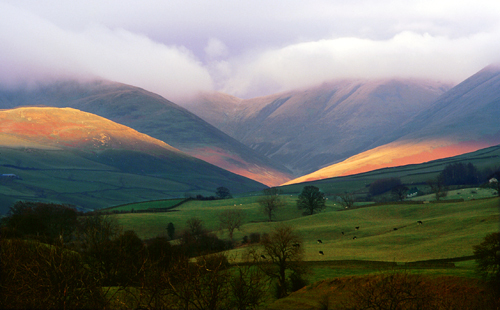 explores the southern side of Dentdale starting from the picturesque village of Dent. An ascent of Whernside from the village of Dent. This route takes you past three of the other major engineering achievements on the Settle – Carlisle line. Visit Walking Britain to find more walks around Dentdale. Probley the best walking site in Britain, the sites provides not only detailed routes and maps but also super photographs taken along the routes. Anyone staying at Clark's Cottage will find www.walkingbritain an inspirational guide for exploring the area and beyond. © 2014 James Lever - Clarks Cottage, Dent, Dentdale. All Rights Reserved.